August 6, 2009 Tweedles organized another National Clown Week Celebration at the Community Children's Museum. August 6, 2008 Tweedles organized a National Clown Week Celebration at the Community Children's Museum, Dover, NJ. Below is some of the printed coverage the event recieved. Clips from the day also aired on WWOR news. Spending the afternoon with a dozen jokers dressed in colorful garments, outlandish makeup and gags that date back to the Catskills, can border on sensory overload, particularly if you are 5 years of age. 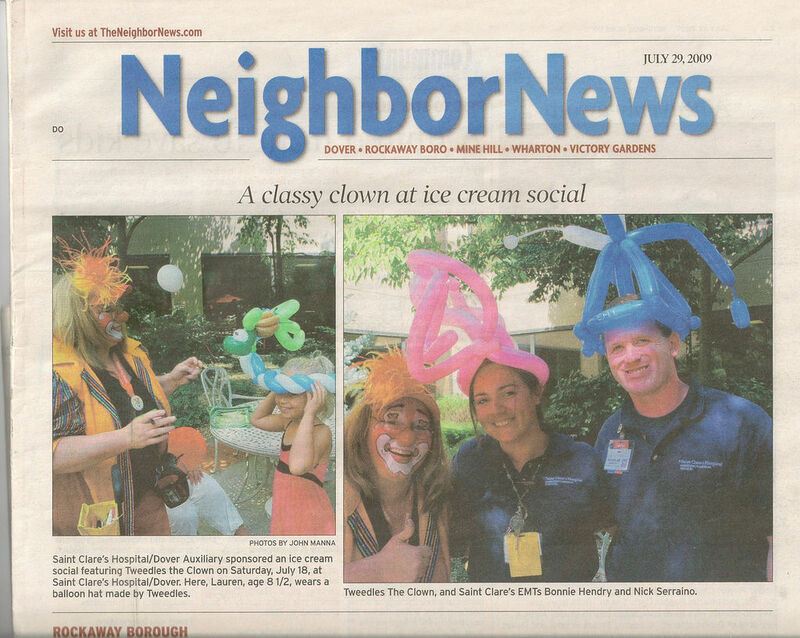 So it was last week when The Merri-Makers Clown Alley #51, a branch of the New Jersey chapter of Clowns of America International, who are based in Parsippany, marked National Clown Week (Aug. 1-7) by paying a visit to Dover’s Community Children’s Museum. They entertained children with a program of magic, juggling, face painting and hilarious skits. Organized by Patti Meyer, a 20-year professional clown also known as Tweedles, the group demonstrated their circus skills in the children’s museum located near Dover’s train station at 77 East Blackwell St.. The museum, perhaps the town’s best kept secret, is open Tuesdays through Sundays during the summer to provide children (aged 6 months and up) with a “hands-on experience where they can explore, create and have fun with their families,” said Jody Marcus, the museum’s executive director. With learning stations positioned throughout the museum and manned by clowns with colorful names such as: Dandy Dan, Jo-Joe, Pollydoodle, Bo-J, Ruthie and Cookie, the clowns demonstrated their skills at balloon making, face painting, magic and juggling. The clown group consists of amateurs and professional clowns who meet monthly at Parsippany’s United Methodist Church at 903 South Beverwyck Road. The Community Children’s Museum is a non-profit organization supported in part by the Arts Council of the Morris Area. For more information go to www.communitychildrensmuseum.org or call 973-366-9060. Photo1: The Merri-Makers Clown Alley #51, a branch of the New Jersey chapter of Clowns of America International, takes clowning seriously. They conduct monthly meetings at Parsippany’s United Methodist Church. Photo 2: National Clown Week, Aug. 1-7, was celebrated at the Community Children’s Museum in Dover with a visit from The Merri-Makers Clown Alley #51. They entertained children with a program of magic, juggling, face painting and hilarious skits. Here, Pollydoodle the Magic Clown uses balloons to create an underwater scene featuring Dori the fish, from the Walt Disney movie “Finding Nemo.” She presents it to Aiden Rayan and his little brother, Brady. Above, after a sufficient amount of greasepaint has been applied, Patti Meyer, known as Tweedles the Clown, adds her signature trademark, a heart above each eyelid. She then pats her face with white powder to dry her make-up and then squirts it with water to wash away the residue. After a brief pause to towel dry, she completes her clown face with a red nose and blonde wig. Tweedles is now ready for her close-up and to celebrate National Clown Week at Dover’s Community Children’s Museum. Find Clown for childrens parties in your area.